Get crafty with the gals at Sticks and Steel! Get ready for their first ever egg decorating workshop. This easy-peasy workshop requires zero skill. Just the desire to remedy a serious case of spring fever and be around a group of fun-loving women. You’ll receive a set of adorable etched wooden eggs, a little guidance, and all of the materials you need to make your masterpieces. 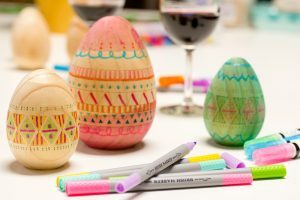 Choose between two sessions to decorate your eggs! Seats are limited, so hurry and reserve your spot! This class is all about you and a little girlfriend time. Sticks and Steel is requesting all attendees be 21+.